As the third installment in the series on prescription drug awareness (see the first entry "The Valium Drug Test & The Xanax Drug Test - Fighting Prescription Drug Abuse, Part I" and the second entry "Prescription Drug Problem Grows") today I present a review of a new movie on Oxycontin abuse and where the drug supply originates. This is a film that drives home the necessity of dealing with this problem on a large scale and even on a home drug test scale, which you can do with an Oxycontin Test. In this film for Current TV's "Vanguard" series by Mariana van Zeller, the crew finds, in her words, that Florida is becoming "the Colombia of prescription drugs." Oxycontin, when used correctly, provides pain relief on a slow release schedule. When smoked, snorted, or injected, it provides a heroin like high. As Ms. van Zeller says in her documentary, "it's basically heroin, made in a lab." And as heroin can be cheaper than Oxycontin, users sometimes turn to heroin to find the same high. This is a serious problem that can be detected at home with an Oxycontin Test. On average, 11 people a day die in Florida from prescription drug overdoses. One interviewee in the documentary described how he was able to obtain thousands of pills a month by shopping around Florida clinics. Ms. van Zeller displays pages of newspaper advertising for Florida pain clinics. All 50 of the top oxycodone dispensing clinics in the United States are in Florida. Florida lacks what is called a "prescription drug monitoring plan." There is no shared database to monitor if you've already received prescription drugs from another clinic. To boot, pharmacies exist on-site at some Florida clinics, making drugs easier to obtain. Knowing this drug has heroin like highs, the existence of an Oxycontin Test is of no surprise and could be a valuable tool in helping someone struggling with this addiction. 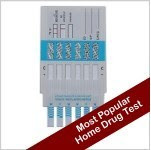 This test also functions as a home drug test for Vicodin, another commonly prescribed and abused prescription drug. If you think this test could be of use to you you can purchase it at Home Health Testing today. For anyone unfamiliar with the social and personal affects of Oxycontin abuse, this documentary is a must-see. It exposes many aspects of this new phenomenon (people travelling from Ohio and Kentucky to visit Florida for drugs, people buying drugs to deal them) and lays out the conditions that are allowing this extremely unsafe drug to thrive. Highly recommended.